Create-a-cut™ - How does it work? The design of this cutter is ingenious - at least I think so (insert big, silly grin). 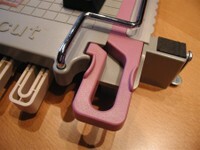 The cutter comes with one set of blades in place - then beneath the cutter there are two slots that hold the additional two sets of blades right there within easy reach. 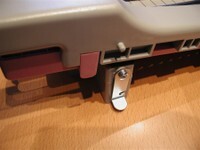 The blades are removable and are held in place by the "handle" locking into place. Squeeze the handle and you can remove the blade and insert a different one. 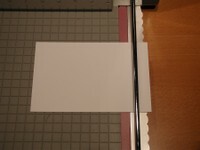 The key is making certain you push it completely into place before you begin cutting. 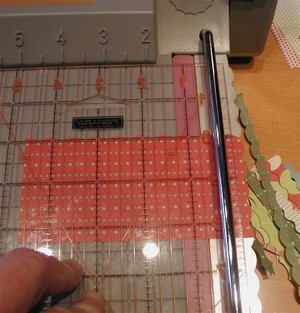 The only additional tool you will need that does not come with the cutter is a wide, clear Fiskars ruler. 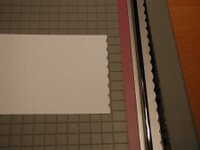 This helps keep your projects square, assists you in making cuts that are in increments less than the 1/2" guide that is located at the top of the cutter and allows you to cut your paper into the tiniest of smidgeons by holding it in place underneath the cutting bar (do not hold the paper with your fingers - you just might loose them if you aren't paying close enough attention.) 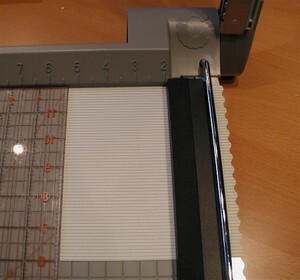 I use the Fiskars ruler by bumping it up square against the top of the cutter and then placing my paper square against the ruler, putting the Gripper on top of the paper next to the protective wire. 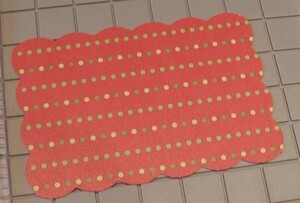 When it comes to cutting small pieces I also use the Fiskars ruler to make certain that my project is square. As you can see in this picture you can then align your corners up perfectly with the cutting blade and you will get a perfectly scalloped square each and every time. I'm LOVIN' this! WOOHOO - this was my first try ever and I nailed it! So if I can do it I'm guessing you can too! Another example of hitting it right the first time is shown below. By placing your finished width card on top of the blade and positioning it over the blade so that you get the scallop to start and stop in precisely the place you want your valleys/peaks to be, you will receive a perfectly placed cut each and every time! Awww - the beauty of tools I could have never, ever imagined. I haven't even begun to play with the deckle (or ripped as it is called) blade - oh, and I completely forgot to mention that there is a straight edge blade available as well. I have some fun ideas up my sleeve with that one, but just haven't had the time. Could you all please grant me my wish that I have more hours in my day, or that my body would function beautifully without sleep, or ??? Perhaps cloning - is that the answer - LOL! I'm sure I forgot something in these lengthy posts, but I'll try and post as I think of things. I hope to inspire you with the fun things that are just jetting through my brain since beginning to play with my new toy! Please don't hesitate to contact me if you have any questions. From what I understand is the gentleman who manufactured these in his small business retired. Don't know if he sold the business or just closed it. I'm having trouble finding any info on the create-a-cut. I purchased this a few years ago. I really love mine and would like to purchase the straight blade. It doesn't come with it. Do you know where I could get one? Thanks. You have a link to the create-a-cut but it's not working. Are these still available for purchase? Could you give me details? I love your work and would love to be able to do the things you illustrated. How amazing is this? I can't wait to order one. Okay Ellen, I see that it does exactly what I need it to do, how fast can I get one??? If I could jump up and down I would(wink and BIG silly grin).